This past week I created two cards I am pretty happy about. I had a concept in my head for each and I was able to actualize it which isn't always how it works for me (I wish it was the norm!). I set myself another challenge as well. I have all these lovely kits I have stockpiled because I am a hoarding nut. It is embarrassing to admit my problem, but isn't that the first step? Hello my name is Shay and I am a hoarder of all craft supplies. I decided enough is enough (plus I am running out of room), so I thought I would break into my Scarlet Lime kits and use those to create my cards. After looking through them I decided on a kit with lovely limes and turquoises for the wedding card and then I chose another with bright vibrant colors with a touch of black for my friend's birthday card. 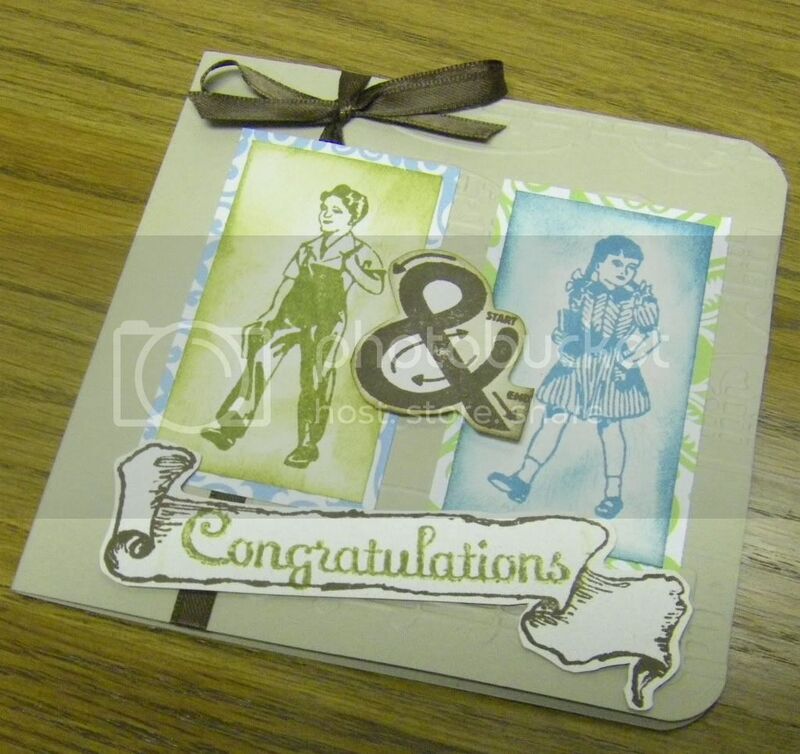 I began on the wedding card on Sunday evening with a great idea to use my vintage boy and girl and the ampersand stamps from Studio Calico (sadly they are all retired now). I was happily adding patterned paper and rub-ons from my Scarlet Lime kit (horrible hoarding admission time: that was the first time I had used a rub-on although I have bought more than a few over the years) when I decided my card-base was all wrong. So Monday night I went with a more basic card-base and set the other aside for future use. 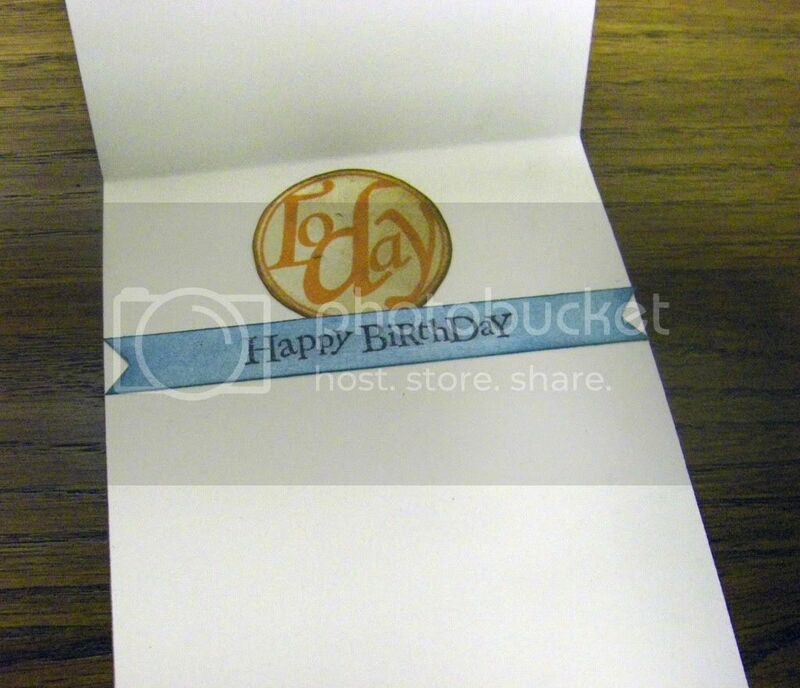 I think all turned out well with the card although it may be cleaner than my natural inclination. Last night I knew I had to make a card for a friend's birthday which is this upcoming weekend and needed to get in the mail pronto. I knew I wanted to use some of my Kenner Road stamps for a vintage look (and they are gorgeous!). 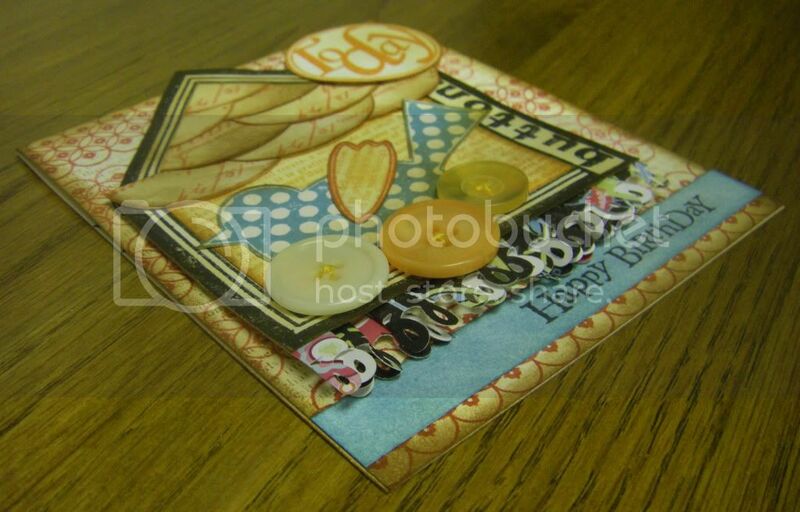 I remembered seeing some wonderful projects that Katie Watson created whilst on the Kenner Road design team back in October 2009 and they proved to be an inspiration for the card I made. 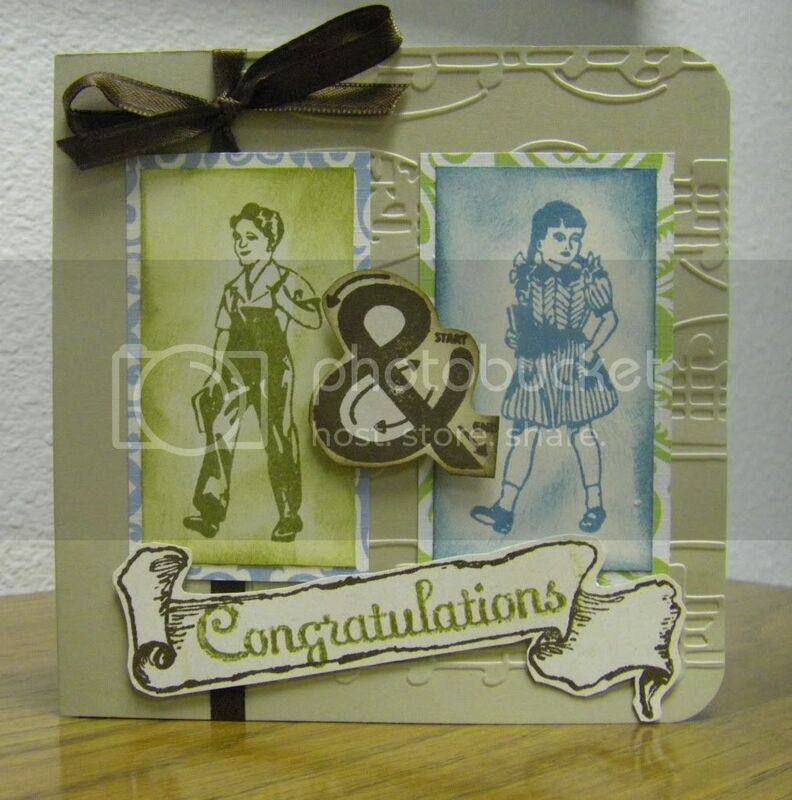 The other inspiration for me is one of my favorite, favorite cardmakers of all time: Betsy Veldman. 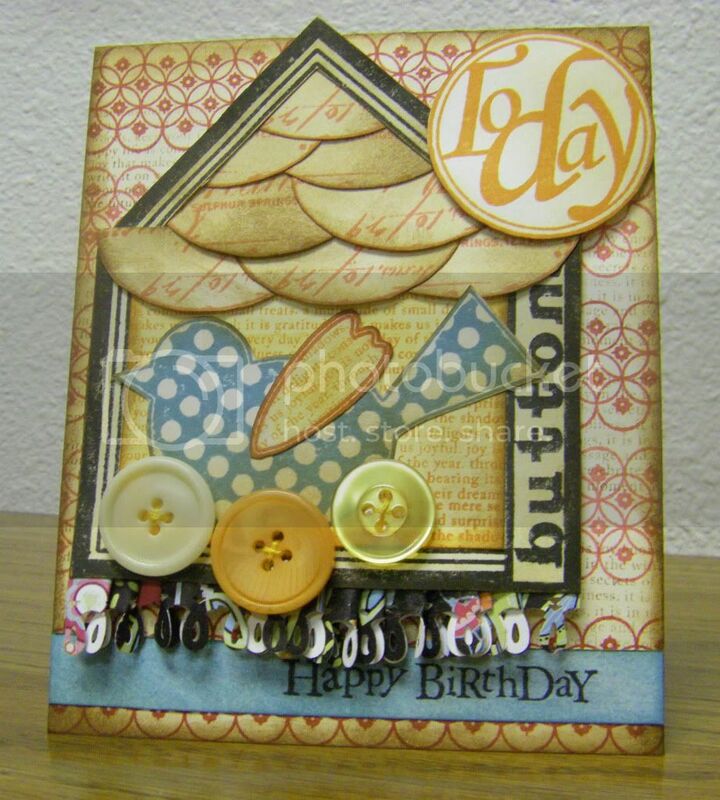 A lucky choice of adding the buttons around the that adorable bird stamp makes it took a bit like a nest to me. Another lucky choice was "ruffling" up a strip of punched patterned paper which just wasn't working before. I learned the basic technique in a Basic Grey card class I took locally (you place a strip of adhesive on the backside of a long strip of paper and then pleat--fold--the paper onto itself which remains in place because of the adhesive. The smaller the pleat, the longer the paper needs to be) and I thought why not try it with the patterned paper I had punched? It worked out just right--adding interest, flair and some texture and I even like that a bit of the white from the back peeks through. Thank you for calling at the Hall! I hope you enjoyed today's cards. Thank you for posting these yummy cards! Lime green and turquoise are two of my favorite colors! And that ruffling of the punched paper strip is fantastic! I hope you don't mind if I copy that idea!!!! Great work!